Restore your skin and regain your youthful appearance. What Kind Of Improvements Can Be Made With Dermal Fillers? How Long Will It Take Me To See Results After Dermal Filler Injections? How Long Will The Results From Dermal Fillers Last? How Long Is The Recovery From Dermal Filler Injections? At what age should I Start Getting Dermal Filler Injections? Will I look natural after getting dermal filler injections? Dermal fillers (also called soft tissue fillers) are a non-surgical injectable treatment used to restore facial volume, create youthful facial contours, add volume to lips, and smooth out and reduce the appearance of fine lines, wrinkles, and folds. According to the American Society of Plastic Surgeons (ASAPS), dermal fillers are the most common non-surgical procedure after BOTOX®, and are typically used as part of an ongoing skin maintenance routine. There are currently many dermal filler products available on the market, the most popular of which are based on Hyaluronic Acid (HA), a substance that naturally exists in the human body, lubricating soft connective tissues, the skin, the eyes, and certain joints. The Hyaluronic Acid found in popular dermal fillers such as Juvederm®, Restylane®, Perlane®, VOLUMA™, and Teosyal® is a synthetic compound that acts similarly to the natural substance. It attracts water molecules and therefore acts like a cushion, propping up existing facial structures that have lost volume and elasticity as part of normal aging. By increasing the skin’s supply of Hyaluronic Acid, dermal fillers revitalize and add volume to the skin, smooth out wrinkles and lines, fill in hollowed out areas, and impart a softer, more youthful appearance. Loss Of Facial Volume: As we age, the fullness of youth is lost, which is most evident in areas such as the lips, cheeks, and eyelids. By restoring volume, fillers are able to directly improve a gaunt appearance by filling in hollowed or sunken areas. Tissue Sagging: As skin ages, it atrophies, which affects the appearance of skin under the eyes, around the lips, the chin, jowls, and the area between the nose and the mouth. Nasolabial Folds (Laugh Lines): Lines from the nose to the corners of the mouth. Marionette Lines: Lines from the lips down to the sides of the chin. Lipstick Lines: Lines on the upper lip created when the lip is pouting, such as during lipstick application, cigarette smoking, etc. Corners Of The Mouth: Downward pointing lines emanating from the corners of the lips, which give the appearance of a grimace. Fine Lines: Fine facial lines become more problematic with the passage of time – in particular, tiny lines below the eyes, and around the lips. Hand Rejuvenation: Even if you are able to maintain a youthful look, withered hands are often a telltale sign of age. Dermal fillers are not just for the face, and are very effective at rejuvenating the appearance of hands, by making them appear smoother and suppler, while minimizing wrinkles and hiding prominent bones and veins. 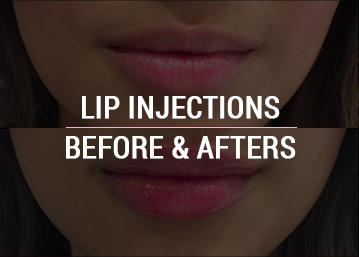 Lip Augmentation: Fillers can be used to plump up thin lips, rendering them more voluminous and attractive. Augmenting The Cheeks: A gaunt, sunken in look can be improved by the administration of fillers. Improving The Shape Of The Nose: By strategically injecting dermal fillers in the right location, a crooked or disproportionate nose can be drastically improved without surgery. Narrowing The Appearance Of The Jaw Line: A wide jaw line is not considered to be feminine. Strategic injection of dermal fillers to the Masseter muscle can make the face appear narrower and more attractive. The dermal filler that is selected as being the most appropriate for you is eased into your skin using a very fine needle. Depending on the improvement you are trying to achieve, the filler will be injected along wrinkles and deep facial folds, or into hollowed out areas of the face that have lost volume due to age. The procedure itself should take approximately 15 minutes. After getting dermal filler injections, you will be able to immediately see some results, however, it will take about 48 hours to see the full effect. The results will typically last up to six months. After this period of time, you will need to receive fillers again to maintain your rejuvenated appearance. If you opt to stop getting injections at any time, your appearance will just revert to its original state. Dermal fillers fade very slowly and gradually, so for the vast majority of patients, results should last between 6 and 9 months. After approximately 6 to 12 months, the effects of the dermal filler gradually weaken, until your skin returns to its natural state. The specific amount of time dermal fillers last varies depending on the patient’s skin, the treatment area, and the type of product used. As treatment with dermal fillers is temporary, they require touch-up injections for maintenance, and eventually repeat injections. At Skinjectables Cosmetic Clinic, our experienced health care practitioners will determine the ideal time interval for your follow-up treatments, and develop the optimal injectable regimen to suit your needs. Alternatively, if you decide not to maintain your new appearance, the results will gradually disappear over time. After receiving your dermal injections, you might experience some mild redness, swelling, tenderness, bruising, or itching. These effects should clear up in less than 7 days (or 14 days for lips). Redness can be concealed using foundation or concealer. In general, most patients experience little or no downtime – which means you can return to work and continue with your usual daily activities. The cost of dermal filler injections depends primarily on the amount of dermal filler injected, which in turn depends on the amount of product you require to achieve a significant result. At your consultation at Skinjectables Cosmetic Clinic, your unique facial features will be assessed, your concerns will be taken into account, and a treatment plan will be developed. At this point, you will be told the exact amount of filler you will require. Please view our prices for cost of procedures. Most patients only experience mild discomfort. As the needles used for dermal fillers are very fine, the amount of pain experienced by patients is minimal and the procedure does not require anesthesia. It should also be noted that many of the dermal filler products available today contain Lidocaine, a local anesthetic, to minimize your discomfort. Topical numbing creams can be used to further minimize discomfort when injecting sensitive areas. Finally, at Skinjectables Cosmetic Clinic we have a unique device that can be used to reduce or eliminate the discomfort you may experience during your procedure. Fortunately, there is the option of completely reversing the results you obtain from Hyaluronic-Acid based fillers if you are not happy with the results. A solution called Hyaluronidase is simply injected into the treatment site which effectively dissolves the filler within approximately 24 hours. The age at which you start using dermal fillers depends entirely on the type of issue you’d like to address. While severe wrinkles and folds typically become evident well into middle age, fine lines appear much earlier. Moreover, there are a number of issues which dermal fillers are very effective at addressing, that are not always related to aging, such as a sunken appearance, thin lips, a wide jawbone, or a crooked nose. In general, however, dermal filler products should not be used in individuals under 18 years of age. Dermal injections, such as Juvederm®, are designed to smooth out lines, wrinkles, and folds, or create more youthful and attractive facial contours by adding volume in strategic areas. 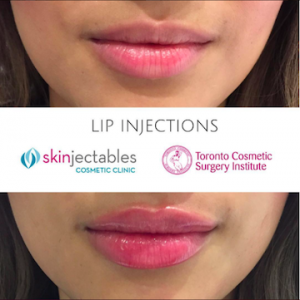 When injected by an experienced health care professional at Skinjectables Cosmetic Clinic in Toronto, these products will look and feel natural. Dermal fillers are approved by the FDA, and have an excellent safety track record. Since Restylane® is a synthetic substance produced through a biotechnical process, it contains no animal products, which limits the risk it may pose as an allergen or as a transmitter of animal-based pathogens. Additionally, the dermal fillers used at Skinjectables Cosmetic Clinic in Toronto are all Hyaluronic Acid-based, which is a substance that naturally occurs in our bodies, and has been used for over 20 years for arthritis treatment, wound repair, and eye surgery. Dermal fillers are very similar in composition to the Hyaluronic Acid that naturally exists in your body, as such it is very unlikely to induce an allergic reaction. To reduce the risk of complications and ensure your safety, your practitioner will review your medical history, including allergies and medications, at your initial consultation to determine whether you are an appropriate candidate for fillers. The most common complications associated with fillers include receiving results other than you had intended, tiny lumps or irregularities under the skin, and prolonged redness. After receiving dermal filler injections, patients prone to cold sores may develop an outbreak. Those with HSV-1 should therefore be treated with a course of antiviral medication prior to the procedure. More serious complications such as infection and tissue necrosis are exceedingly rare. There are a plethora of hyaluronic-based dermal fillers available on the market, and while they are all comprised of the same substance, they differ in the way their molecules are packed together and stabilized. This has an effect on the consistency of the product (i.e. gel-like vs. granular), and how long it last, which in turn makes each one ideal for treating specific types of issues. When you arrive at Toronto’s Skinjectables Cosmetic Clinic for your consultation, your skin will be assessed and a recommendation will be made as to which filler product would be most suitable for you. Juvederm® Ultra and Juvederm® Ultra Plus are products designed to treat moderate to severe wrinkles and folds. These smooth consistency gel products are injected into the mid to deep layers of the skin, smoothing away fine lines and wrinkles around the mouth, nose, and eyes, resulting in a more rejuvenated appearance. Juvederm® is FDA approved to last for up to a year after the initial injection. These products contain Lidocaine, a numbing agent, to minimize your discomfort. Juvederm® Refine is a new formulation released by Allergan that was specifically designed to treat fine lines. Addressing the initial signs of aging at the outset before they become deeper, will allow you to maintain a smoother, more youthful appearance, for a longer period of time. Refine is ideal for improving the appearance of finer lines such as crow’s feet, smile lines, and more superficial forehead lines. Juvederm® VOLUMA® was specifically developed to restore facial volume on a larger scale, and is particularly effective when injected in the cheeks, cheekbones, and chin. In addition, VOLUMA® is a smooth, consistent gel, which is able to impart long-lasting results. Juvederm® VOLBELLA® is a new product created specifically to augment and smooth out lips. The main benefits of VOLBELLA® are that its results can last for up to 12 months (which is double the time of other lip fillers), and it has a shorter downtime compared to other lip fillers. VOLBELLA® also features a unique technology that causes it to attract less water molecules, and thereby reduce the amount of swelling. The results you get from VOLBELLA® are beautiful, smooth, and natural looking. VOLBELLA® also contains Lidocaine to minimize any discomfort you may experience during your procedure. VOLIFT® is the latest product available from Juvederm®, and was created to address the smiles lines which run vertically between the tip of the nose and the outer corners of the lips (parentheses). Smile lines age the appearance of the face and can even make us appear sadder and worn out. VOLIFT® works to soften the appearance of smile lines, and restore firmness and suppleness to this prominent area of the face. The results are visible after just one treatment and have been proven to last for up to a year. This product is formulated with Lidocaine to increase comfort during the procedure. Restylane® was the first stabilized Hyaluronic Acid-based filler released on the market and has been used in over 11 million injections worldwide since 2010. Restylane® adds volume and fullness to the skin, and is ideal for correcting moderate to severe facial wrinkles and folds. Restylane® immediately improves facial contours so you will be able to see your results right after treatment. Restylane® is commonly used to add fullness and contour to lips. The two formulations available are Restylane® and Restylane-L®. These products are identical except that Restylane-L® contains the anaesthetic Lidocaine, which can minimize any discomfort you may experience during your procedure. Beauty Booster is an injectable treatment that revitalizes skin, improves hydration, and imparts tighter skin tone and a luminous glow. It is specifically designed to treat and improve a dull complexion, parched skin, and fine lines on the face, neck and décolleté. The Beauty Booster involves the application of Teosyal Redensity I with a machine called the V2, which incorporates a new micro-needling technology. Teosyal Redensity I is an award-winning product offering composed of ingredients naturally found in the skin, which acts as an overall skin enhancer and revitalizer. Teosyal Redensity I serves to improve several characteristics of our skin that are negatively impacted by age: tone, luminosity, and hydration. This product is revolutionary in that it helps to restore a youthful, dewy complexion by diminishing fine lines and increasing skin vibrancy and luminosity. It helps to redensify your skin and helps restore its ability to reflect light. Redensity I is applied using superficial injections. It is a non-cross linked hyaluronic acid based gel which contains vitamins, antioxidants, minerals and amino acids to enhance the quality of the skin by stimulating collagen and elastin production. This product will revitalize and hydrate the skin, provide it with a smooth appearance and restore its youthful glow. Teosyal® is a European Hyaluronic Acid Filler which has a very high concentration of Hyaluronic Acid, and cross-linked gels that provide long-lasting results and minimal downtime following treatment. Teosyal Redensity II is the first dermal filler developed specifically for the area below the eyes, which is the place where the first signs of aging often appear. Redensity II is very effective at smoothing out and filling out the fine lines, dark circles, and deep hollows under the eyes, giving you a refreshed, more youthful appearance. Additionally, Redensity II is also excellent at smoothing out the vertical lines in upper lip area, which previously was a very difficult area to treat. There is no downtime following treatment with Teosyal Redensity II, meaning that you can literally return to directly to work following your procedure. Teosyal® was formulated for medium line correction. It is generally used to treat moderate nasolabial folds, forehead lines, wrinkles around the mouth, as well as for any other mild to moderate wrinkles. This product is long-lasting, safe, and provides immediate results. It is composed of several hyaluronic based products which act like a sponge and enable it absorb one thousand times its own weight water, which results in skin that looks plump and smooth. While skin appears more soft and supple on the surface, in the deeper dermal layers, the filler effectively fills the gaps between cells, which smoothens wrinkles, and restores lost volume. Teosyal® Ultra Deep is the densest product in the Teosyal® range. It was formulated specifically for the deep filling of folds and grooves, with the intent of creating volume in targeted areas of your face. Over time, volume is lost through the aging process, and since the layer of underlying facial fat is less than what it used to be, it can no longer support the skin to the extent that it once did. As a result, your facial skin becomes lax, and begins to droop and sink. A youthful face is characterized by the “triangle of beauty” with ample volume in the cheek bone area, tapering off in a narrow chin area. The drooping that is caused by a loss of facial volume therefore results in skin that folds over creating deep nasolabial folds and marionette lines, and the face becomes more square-shaped, with the volume concentrated along the jaw bone as jowls rather than at the cheekbones. Teosyal® Ultra Deep is one of the most effective solutions for restoring facial volume in the mid-face, reducing folds, and thereby smoothing out the face. By providing increased support at the cheekbones, Teosyal® Ultra Deep also aids in chin restoration. Achieving sharper angles at the jawline will allow you to regain your youthful contours. Since Ultra Deep is such a strong product it has the added benefit of being very long-lasting, and can even last up to 12 months. For most patients however a top-up before that will be beneficial and extend the results.